“Don’t move,” comments Ted Kim, who lingers in the doorway of C Space, watching Michelle Dyk intensely paint my 15-minute portrait. She smiles, readjusts the canvas, and gives me full attention. It’s an intense process, her brush vigorously scrolling across an emerging face while thick globs of paint traverse the canvas. Michelle shares C Space with fellow artists Aaron Nathan and Sarah Wright. Located in Billings Open Studio (the construct of Ted Kim), C Space is one of several studios in what was formerly the wide-open third floor of the historic Kress Building in downtown Billings. The place buzzes with creation along an expansive hallway of doors, each opening to a separate workspace, yet the feeling is still open, collaborative. You can hear the shutter clicks, the paint brush flicks, and conversations buzz about you, giving a sense of excitement and energy to the space. Michelle, whose family moved to Billings when she was 7, has a contagious enthusiasm for life and a laugh of warm, girlish charm that makes you smile. She has been cycling around art her entire life, and graduated from MSUB with a degree in fine art in 2005. She comes across unbroken, excited at the everyday, intently focused on her immediate surroundings. Though Michelle often can be found in the studio, she’s a mobile painter. She paints in her living room, her studio, at her grandma’s, at the pub. Across all these venues she’s been painting 15-minute portraits, and she’s finally amassed 100. The project, which she began in early 2015, wasn’t deliberate at first. She started with one. Then painted another. Her husband suggested she continue to 100. Now she has a tower of faces she’s readying for an installation at Yellowstone Valley Brewing Co. on May 15. A mix of fluid, expression-filled faces highlighted by daylight, bar light, flashlight…the pieces are as wild and diverse as Michelle, whose fluorescent pink hair has been one of her defining features since childhood. Each portrait has a rich, deliberate color palette with striking eyes that pulse as the heart of each piece—and each was created in just 15 minutes. It’s a bit excruciating when the timer goes off, Michelle admits. She’s literally had to restrain herself, hurling around the studio instead as she steps back from the painting she gave herself such a short amount of time to produce. Michelle likes glitter, another indicator of her shimmery, festive personality. “It’s reflective and plays with light. I find people are like little pieces of glitter, always changing,” she says. Through 100 portraits, Michelle has learned to accept what she’s created. “There is no revisiting. I find the beauty in what I’ve done, and I learn from it,” she says. Michelle has painted toddlers to 80-somethings, though her subjects aren’t all hand selected. 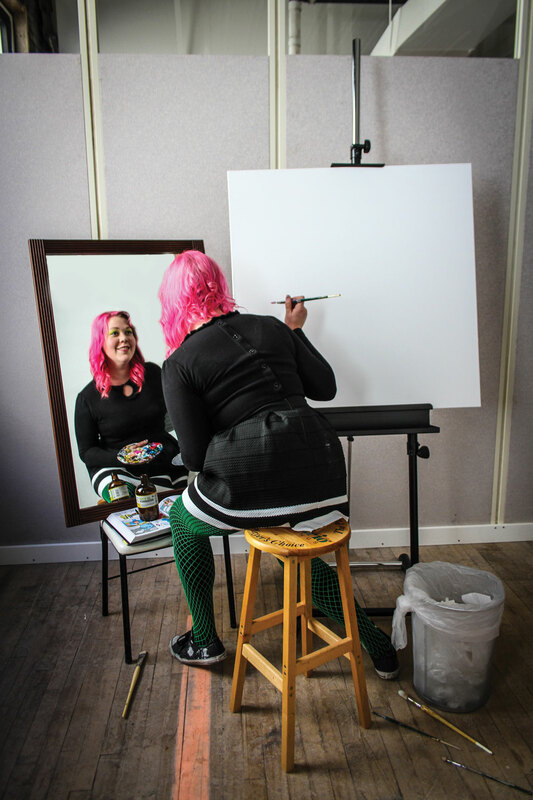 From her husband to her best friend to local artists, Michelle has painted people she’s intimately familiar with, but she’s also painted complete strangers. Michelle has painted several local artists of which she holds in high regard. When she painted John Lodge, he moved around the entire time, singing, whistling, and asking her if she could do the same. Of the creative process, Michelle said there are faces she knows so well (including her own), it's like breathing when she paints them. To get ready for my portrait, Michelle has me sit where we’ve been interviewing, a space she says I’ll be most comfortable. Around me water drops hit buckets, as the aging ceiling of the historic building gives way to the springtime rain. Her painter’s palette is rigid and mountainous, covered in colorful splats from previous portraits. I pick a canvas of orange and red with gold sparkles. It reminds me of David Bowie. I wanted the pink one, but I’m still getting over my pink rejection from the Pepto-Bismol walls and carpet of my youth (why, I figure, I dressed in black for most of my teenage life). Still, I put on a pink lip gloss to get a bit of that girly feeling, which I hope picks up in the paint. Michelle takes a swig of kombucha, dons an apron, and begins to gather her paints, picking colors while assessing my face. She aligns her paintbrushes, varying in thicknesses, their bristles dyed murky blue. She sets the timer and launches in. There is a sound to what Michelle does, a scratching of brush against glitter. She grabs the canvas, picking it up off the easel as she traverses the painting with urgency. She soon quiets her stroke, but there’s deliberate movement across the canvas, her eyes raising to meet mine every handful of seconds. I look back at her face, framed by signature pink hair and painted with yellow and blue eye shadow. She swoops in close; I smell her perfume, a scent that is instantly familiar from the many hugs we’ve exchanged. An Abba song comes into my head…“Watching me watching you…” Damn it…why do I soundtrack everything? I find myself avoiding direct eye contact. As her eyes bounce from my face to the canvas and back, I question my inability to maintain eye contact. When our eyes meet, she smiles. I raise my right eyebrow. “We’re going down fast,” shouts Ted. The space lacks buckets to catch the continuing rain. “Full speed ahead,” shouts Michelle. I decided to sit up straight. My head feels heavy, and I can’t stop smiling. She keeps a small, subtle upturn of mouth as she works. I watch the way her face move while she paints, the pout of her lips and the focus that she brings to the canvas. The first 10-minute timer goes off. Michelle steps back from the work, giving herself five minutes to assess the situation before finishing the full 15 minute session. The last five minutes are a bit slowed as she focuses on detail work and the nuances she’s been observing. I do wonder about my smile—is it real? Do my eyes look tired? How’s my hair? I consider the process, this ticking clock and being immersed in the minutes. What happens when we let our creative brains run wild? What do we gain when we allow connection to flow between us and allow imprints from other people in this fluid movement of time? Existence is the process of painting, a fluid, experiential, conscious attempt to communicate feeling, show our unique perception, illustrate that we are the sum of our moments to moments: a snapshot and you move forward. Each interaction is just a brief stamp on our lives…but here…in this painted moment…This…It’s all we have.